Our list is not exhaustive or comprehensive but they are all measures that will reduce the chances of having your bike nicked. Due to increased motorcycle insurance premiums and the excess on your policy, it is worth investing in several different methods to secure your bike, not only at home but also when you pop to the shops for 5 minutes. If you scrimp on your bike's security you may pay the price in the long run. It isn't worth the risk! Lets face it, no-one likes to see their pride an joy vanish without trace, the inconvenience caused, claiming from your insurance company (if they pay up), buying a new one, informing the police etc, the whole process could take months. Only 26% of stolen bikes are recovered with the majority having suffered major damage. 50% of riders don't lock their bike. 80% of stolen bikes are taken from the owners home. 60% of bikes stolen are broken-up for parts. The theft rate is twice that of cars. The professional can steal your bike in as little as 15 seconds, even with a lock. Datatag - an indelible code etched on your bike's panels makes it difficult for a thief to sell on. Transponders in the petrol tank and wheels can be picked up by a police scanner. Garage Alarm - Buy a motion sensative garage alarm and fix it at the far end of the garage, this gives the thief less time to attack it. Check the location, don't block the sensor, test it, when does it go off? Ground Anchor - Don't place it in the middle of the garage so the thief has more space to use their disc cutter, crowbar etc. 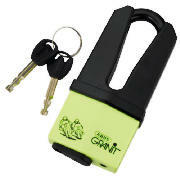 Garage Lock - Use a lock simiar to the Garage Defender, fit in the middle of the door to prevent the corner being forced. Brake lever lock - Often overlooked but very portable and a good supplement to other security devices, it clamps the front brake lever fully on. Disc lock/U-Lock - Lock your U-lock to an immoveable object or ideally fit through the rear wheel and over swingarm, use as well as a disc lock. Fit a disc lock snugly to the caliper. Disc/U-Lock - Very transportable if you're on the move but not a deterant on their own. Kill Switch - Fit an alternative well-hidden kill switch. Side door - Don't ignore the side-door to your garage, make sure it's properly secured, it's no good securing the garage door if you have a side- door made out of balsa wood! Block the exit - If you own a car, use it to block the entry to your bike, into a corner, against a wall or to prevent the garage door being opened. Routine - Wherever possible, avoid parking your bike and the same place, if your regular movements are being watch by an organised bike gang they will know exactly when best to steal your bike. The less opportunities they have the better. Helmet - Don't lock your helmet to the bike, you will make the theft more desirable and increase the likelehood of theft. Guard dog - No-one is likely to argue with a rotweiler, not even a bike thief. Give the impression you own one by erecting a sign 'Beware of Rotweiler'. Ultraviolet Pen - Cheap and effective way of marking various parts of your bike and only visible under an ultraviolet light. Padlock - Use a tiny padlock of the chain, they are unlikely to notice it and if they do attempt to ride it away, it will throw them off. Spare Parts - If you order secondhand spares for your bike, make sure you are dealing with a reputable breaker, an unscrupulous breaker will be aware of their next potential bike for breaking. Fit an alarm to the light switch in your garage, set to off between midnight and 7am. A small job for an electrician. CCTV - If you cannot afford a camera to monitor your bike 24-7, fit a false CCTV camera, they are readily available and a good preventative measure. Police - Ask the advice of your local constabulary (remove your race can before you go down there!). They will have experience of dealing with the scum that want to nick your bike. 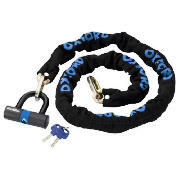 Safety - don't try to carry your locks in a rucksack, many bikes have U-lock compartments under the seat or even behind the number plate, use a disac lock bag, specially for transporting your locks. Park your bike in the living room, we've yet to hear of a thief that's prepared to nick it from there.